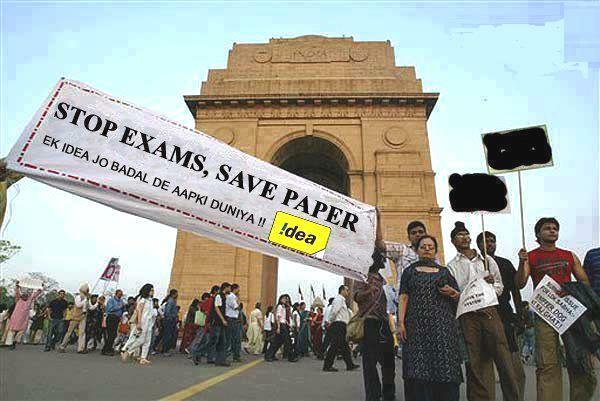 “Say No To Exams And Save Paper.” Is this a mad and crazy idea? Can this be implemented? Ever! May be not, as long as both the teachers and the students continue to test-n-splash their intelligence ON PAPER. It is believed in all societies that the more examinations you pass-n-clear, the more knowledge you possess. The more degrees you have, the more ornamental does your name appear. M. K.Razdan, my C.E.O. who also happens to be the Editor-in-Chief of India’s premier news agency The Press Trust of India or PTI, however, is just a graduate. And he is at the helms for last 20 years, without clearing much examinations, without wasting much papers! Isn’t he an example! If yes, learn to stop wasting papers and contribute in all out efforts to save our environment. Stop writing exams unnecessarily, otherwise trees are going to curse you for felling them and you’ll perform horribly and would get some damn results. O My God… they failed the job seeker!!! I would be happy if my CEO reads this piece and decides to call the guy, praising him for writing his mind. Here, in this case, it is the examiner who needs to be failed because exams or tests are never given… they are taken or written. It is bad English to say, “…give the test…”. Does this inspire you? Are you going to do away with the written tests? Do you promise to sit under a tree and not to cut it? Remember: Buddha got his enlightenment while sitting under a tree. Nowadays people don’t get enlightenment because they don’t sit under a tree. SMILE. Previous Where in the world do students go to study? By Gerald De Jaager, James Ericson”. One of the story consists of a great physicist named Richard Feynman. Ïts a Spencer’s warbler…Well in Italian its a chutto Lapittida. In Portuguese, its a Bom da Peida. In Chinese, its a chung-long-tah, and in Japanese, its Katano Tekeda. You can know the name of that bird in all of the world, but when you’re finished, you’ll know absolutely nothing whatever about the bird.You’ll only about humans in other places, and what they call the bird. So let’s look at the bird and see what it’s doing-that’s what counts. The last few lines are from a write-up by Ashish Kaul, that has been hyperlinked for ready reference. Thanks also for sharing such a good story. …good idea..but i dont know how it would work in the real world, though…!